Harvard dancers Rebecca Neumann, Rossi Walter, Nazc-a-ru Gonzalez, and Halimeda Glickman-Hoch perform "Quartet for the End of Time." 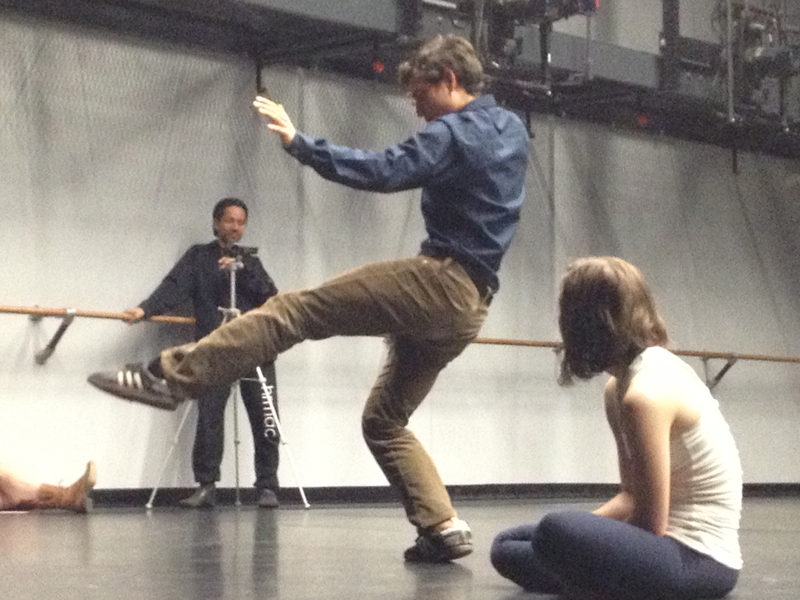 Cabreros demonstrates a movement at an audience discussion following a May 1 performance at Harvard. At the Harvard Dance Center in April, at an evening showcasing the work of emerging choreographers, Irineo Cabreros’s “Quartet for the End of Time” stood out. There was the unusual score, combining mournful classical music with something that sounded like snarling feral dogs. There was the choreography, which included dancers moving their bodies in a driving, iterative rhythm—in disconcerting counterpoint to the music. And there was the post-performance discussion, which ranged from science to religion, and from prostration to apocalypse. Getting involved in dance, he says, was “a complete fluke”: during his sophomore year, he ran into a friend who was going to an introductory meeting of the Harvard-Radcliffe Modern Dance Company, and tagged along. He decided to audition, though he had no previous experience in dance, and began working with one of the “Quartet” dancers, Halimeda Glickman-Hoch ’12, on a piece she created. Speaking about “Quartet,” Cabreros reveals a passion for asking questions, exploring the world, and finding beauty. He used a participatory process to create “Quartet,” asking his dancers to think about different forms of prayer for one rehearsal, and, for another, to bring in a question about how something works. The dancers (who, as it turns out, are all scientists themselves: Glickman-Hoch studies mathematics, Nazc-a-ru Gonzalez ’14 psychology, Rebecca Neumann ’16 statistics, and Rossi Walter’14 history of science) then discussed the material—and plenty of Big Ideas—translating thought into movement, and piecing together the final work bit by bit. Cabreros set the work to, and took its name from, a haunting piece that composer Olivier Messiaen wrote while interned along with a clarinetist, a violinist, and a cellist at a German prison camp in 1940; the quartet, including Messiaen on piano, performed the work for fellow prisoners in 1941. Cabreros’s “Quartet” begins with the four dancers intertwined in a grueling sculptural arrangement in one corner of the room; gradually, using one another, they push and pull themselves upright, giving a sense that a shared commitment to one another, while somewhat burdensome, is more help than hindrance. The growling sounds—recordings of whale communication—suggest a primal atmosphere or the dawn of the world. 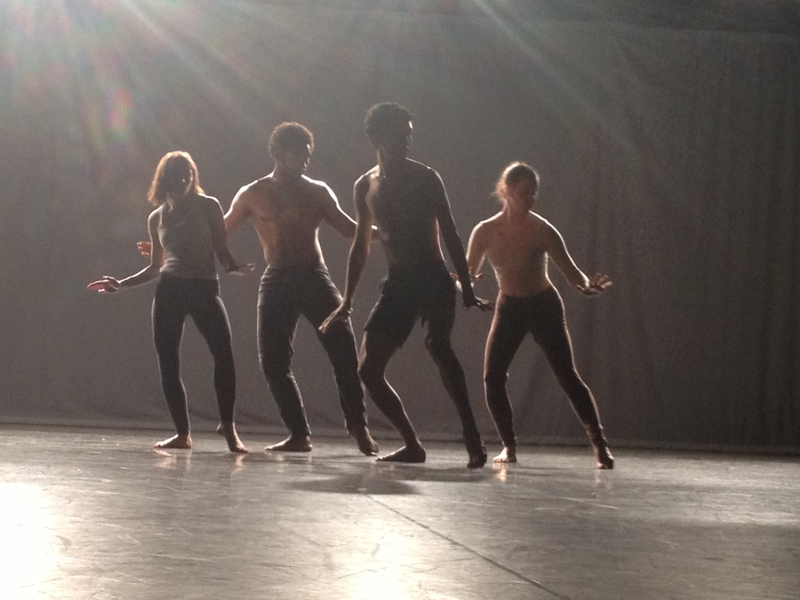 Throughout the work, dancers break away to perform articulated, often anguished solos, but always return to the group, and to the rhythmic refrain that gives the piece its driving force, often in counterpoint to the music: an exhausting sequence in which the dancers’ feet pound out a relentless beat, accentuated by breath sounds and finger snaps, in a marchlike movement that leads to a plaintive, almost ecstatic reaching of arms to the sky, as in prayer or rejoicing. The work is so affecting, moving, and suspenseful that one audience member later said that she felt she couldn’t breathe properly while watching. Kris Wilton is an independent arts writer and editor who has written for WBUR, WGBH, Slate, ARTnews, and The Village Voice, among other media outlets.